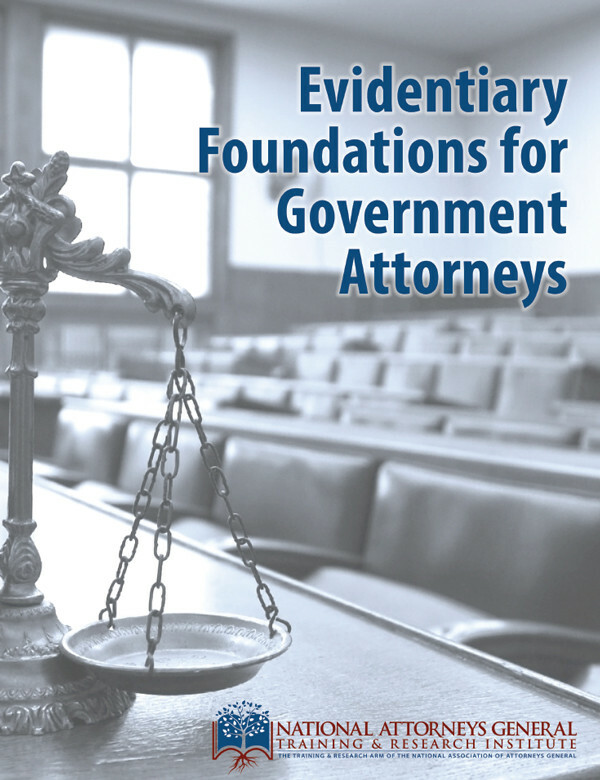 The Evidentiary Foundations for Government Attorneys manual from the National Attorneys General Training and Research Institute equips litigators with a greater understanding of the process of laying proper and sufficient evidentiary foundations. Containing over 200 pages and covering more than 80 examples, the manual gives users much more than simple question lists. Each foundation provides an explanation of the legal concepts relating to each type of evidence and includes, when appropriate, a reference to the Federal Rules of Evidence and relevant case law or other reference, a brief explanation and outline of areas for inquiry, and a sample direct examination. State and territorial AG offices receive a substantial discount as NAAG members with a $50 per copy price. Use promo code AGO2018 when ordering. Other state and federal government attorneys, including prosecutors and district attorneys, can purchase the manual at $65 per copy price. Use promo code GOV2018 when ordering. All others pay $125. Orders will be reviewed to confirm proper pricing.